Forecasters say Tropical Storm Kirk is continuing to move west across the eastern Atlantic but does not currently pose any threat to land. In a Saturday night update, the National Hurricane Center said Kirk was 425 miles (680 kilometers) south-southwest of the Cabo Verde Islands, moving west at 16 mph (26 kph) with maximum sustained winds near 40 mph (65 kph). Forecasters expect some strengthening through Sunday. Multiple media outlets report that National Guardsman Luis Ocampo was working in storm-battered New Bern for 10 days and found his Charlotte home ransacked when he returned Friday. Ocampo said he found everything of value had been stolen, including a large TV, gaming system and a laptop with Ocampo’s schoolwork on it. He said food was also stolen from his refrigerator. Ocampo said his girlfriend and son were staying with family, but had checked on the house Thursday night. By the next morning, his place had been ransacked. Charlotte-Mecklenburg police have confirmed they are investigating. A GoFundMe page for Ocampo had raised nearly $15,000 in one day. North Carolina officials say they have identified three safe alternate routes which motorists can use to access the city of Wilmington, which was virtually cut off by floodwaters from Hurricane Florence. The N.C. Department of Transportation recommends these routes: from the south, take U.S. 17; from the north, take Interstate 40 East to N.C. 24 East (Exit 373), then U.S. 17 South; and from Fayetteville, take N.C. 87 to U.S. 701 South to N.C. 211 East to U.S. 74 East. Transportation officials say motorists can also use Interstate 40 to Exit 373 and N.C. 24 to reach Jacksonville. Officials are still recommending that people avoid any unnecessary travel in hard-hit counties, where the risk of flooding remains. These counties include: Bladen, Brunswick, Columbus, Duplin, Jones, Lenoir, Pender, Robeson, Sampson, Scotland and southeastern Wayne County. A South Carolina mayor says damage from Florence to his town tops the devastation wrought when Hurricane Matthew dumped a foot (30 centimeters) of rain on the area two years ago. Mayor Lawson Battle said Saturday that Nichols is completely inundated by water. He describes the situation as “worse than Matthew.” Nichols is about 40 miles (65 kilometers) inland from the coast. Battle says Gov. Henry McMaster was scheduled to fly into the town later Saturday to assess the situation. He says he hopes the visit will trigger serious talk about quickly getting federal and state funds to the area to help it rebuild. The small farming community lost almost 90 percent of its 261 homes when Matthew hit in 2016. Battle says flooding from Florence has wiped out the 150 or so homes that rebuilt after. An economic research firm estimates Hurricane Florence has caused around $44 billion in damage and lost output. Moody’s Analytics says that would put the storm on par with California’s Northridge earthquake in 1994, which caused $45.2 billion in current dollars. Moody’s estimates Florence has caused $40 billion in damage and $4 billion in lost economic output. The company stressed that the estimate is preliminary and could go higher or lower. If that total is accurate, Moody’s said it would put Florence among the top ten costliest U.S. hurricanes. The top disaster, Hurricane Katrina in 2005, cost $192.2 billion in today’s dollars, while last year’s Hurricane Harvey cost $133.5 billion. Water from the Waccamaw River has started to flow into a Santee Cooper ash pond in Conway, South Carolina. The company says the overtopping of Grainger ash pond No. 1 occurred about 9 a.m. Saturday along the intake canal wall of the dike. Company spokeswoman Mollie Gore says no significant environmental impact is currently expected because they had already excavated nearly all of the ash from the pond. That effort began in 2014 and was on track to be finished in both ash ponds onsite within a few months. An estimated 200,000 tons (181,437 metric tons) remains in ash pond No. 2 in a corner farthest away from the river. Gore says the second pond at the site has additional protection from the rising river, provided by an AquaDam, silt fencing and floating environmental containment boom that was placed during the past week. River forecasts project the Waccamaw will reach a new historic flood level due to Hurricane Florence, eclipsing one set by Hurricane Matthew in 2016. North Carolina environmental officials say they are monitoring two sites where Florence’s floodwaters have inundated coal ash sites. Michael Regan is secretary of the state Department of Environmental Quality. He said during a news briefing Saturday that the state is using drones to get photos and videos from the site of a dam breach at the L.V. Sutton Power Station in Wilmington and at the H.F. Lee Power Plant near Goldsboro. Gray muck has been seeing flowing into the Cape Fear River near the site. Regan said that at the H.F. Lee plant, DEQ employees have seen that coal ash has left the basin and entered floodwaters. He said the DEQ is trying to ascertain how much, if any has entered the Neuse River. Environmentalists are concerned because the ash left over when coal is burned to generate electricity contains mercury, lead, arsenic and other toxic heavy metals. North Carolina emergency officials say residents whose homes were damaged or destroyed by Hurricane Florence will begin moving into hotel rooms next week as a transitional housing program begins. Emergency Management Director Michael Sprayberry said during a news briefing Saturday that residents who register with the Federal Emergency Management Agency will be able to begin the process Monday. The program will be available to residents in nine counties initially and then will be expanded to other counties. Sprayberry said the state’s eastern counties are continuing to see major flooding, including certain locations along the Black, Lumber, Neuse and Cape Fear rivers. A FEMA coordinator said about 69,000 people from North Carolina have already registered with FEMA for assistance. 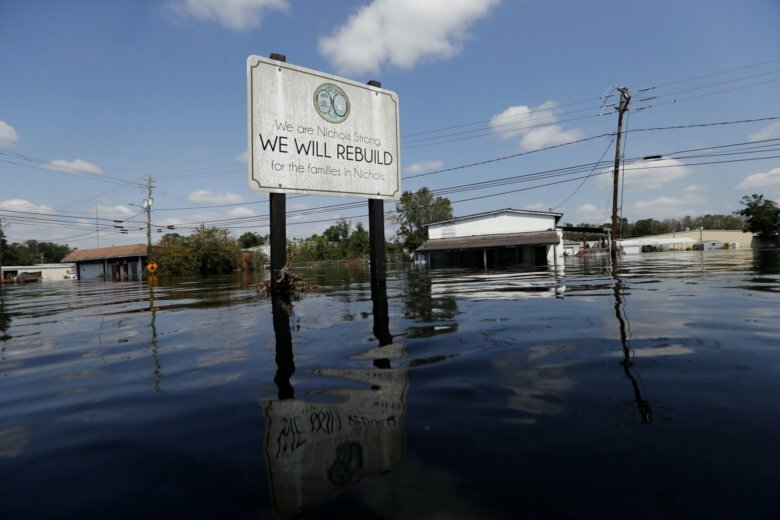 North Carolina’s governor says “treacherous” floodwaters are still threatening the state more than a week after Hurricane Florence made landfill there. Gov. Roy Cooper said Saturday that nine of the state’s river gauges are at major flood stage and four others are at moderate flood stage. He urged residents of southeastern North Carolina to stay alert for flood warnings and evacuation orders. Cooper said the flooding continues to make travel dangerous in hard-hit areas. He urged people to avoid driving east of Interstate 95 and south of US-70. Cooper said certain areas of Interstates 95 and 40 are still underwater. Emergency officials don’t expect the water on those highways to recede fully for another week or more. At least 43 people have died since the hurricane slammed into the coast more than a week ago.